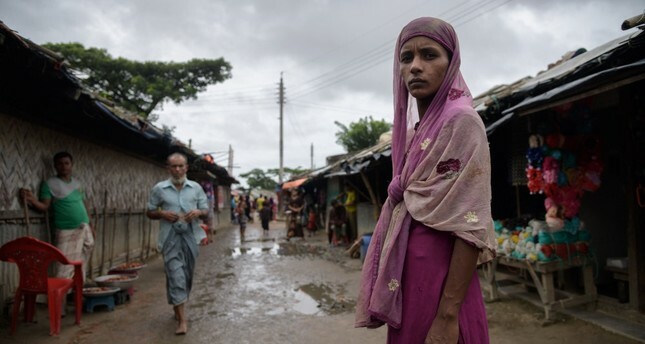 A Rohingya refugee at the Nayapara refugee camp near Cox's Bazar, Aug. 13. Officials detained 33 Rohingya and six Bangladeshis aboard a fishing boat bound for Malaysia in the southeastern part of the Bay of Bengal, said Foyezul Islam Mondol, the head of the coast guard in southeastern Teknaf Upazila. Six Bangladeshis were also arrested, he said. A spokeswoman for the U.N refugee agency in Myanmar said the organization had heard "similar reports" of boats leaving the country but could not confirm their location. "With the prospect of boat movements increasing following the end of the monsoon season, it is increasingly urgent for the authorities to take measures to address the root causes of displacement... and create conditions that foster social cohesion and economic opportunities for all communities," the spokeswoman said. For years, Rohingya on both sides of the border have boarded boats organized by smugglers in the dry months between November and March, when the sea is calm. The perilous journey to Thailand and Malaysia, often undertaken in overcrowded, rickety vessels, has cost many lives. The new departures come as Myanmar prepares to take some of the refugees back after agreeing with Bangladesh to start repatriation on Nov. 15, despite widespread opposition from Rohingya, who say they will not return without guarantees of basic rights, including citizenship and freedom of movement. Rohingya refugees in Bangladesh are "terrified" of returning to Myanmar, dozens of international aid groups said in a petition sent to the governments of both countries Friday. The petition, signed by representatives of groups including Oxfam, Save the Children, and the International Rescue Committee, described plans to begin repatriations this month as "dangerous and premature." "The U.N. has repeatedly stated that conditions in Myanmar are not conducive to return at this time. Refugees continue to flee Myanmar, and facilitating repatriation now would be premature," said the petition from 42 aid groups. "They are terrified about what will happen to them if they are returned to Myanmar now." The aid groups say that while it is true that Rohingya refugees want to return to their homes in Myanmar, they consistently say they will only do so after Yangon guarantees their citizenship, freedom of movement and physical safety. The stateless Rohingya have been the target of communal violence and vicious anti-Muslim sentiment in mainly Buddhist Myanmar for years. Myanmar has denied citizenship to Rohingya since 1982 and excludes them from the 135 ethnic groups it officially recognizes, which effectively renders them stateless.